I often wonder who’s going to write the next BIG parenting book? It seems like every generation has its guru. And with today’s parenting styles running the gamut–authoritative to permissive, supportive to absent, indulgent to neglectful–it’s hard to know who really has it figured out. Throw in your favorite media platform and practically everyone’s an expert nowadays! So, allow me to throw my hat in to the ring. While you won’t find any fancy letters following my name, I do have a theory. 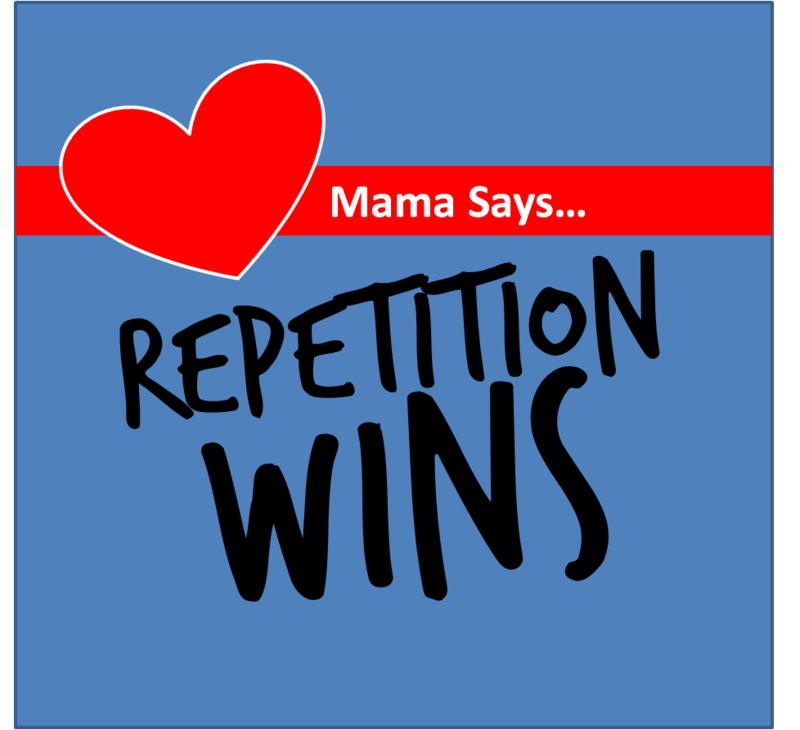 And for simplicity’s sake, I’ve narrowed it down to two words: REPETITION WINS! Genius, right…I know. Basically I’ve been applying this strategy throughout my whole parenting career, I just didn’t know it until last election season. (Stay with me here.) I just happened to be listening to a political strategist ramble on about the power of the message…more specifically the repetitive factor to a particular campaign slogan. He pontificated that through a basic media blitz, they had managed to turn the tide in their favor…especially since today’s voters never bother to research the issues. I equate this concept to the “beloved” brain worm–you know, the little song or ditty that invades your every waking thought! Once it reaches your ears it then proceeds to swim around in your head for hours and if you’re (un)lucky even days. Oh yeah, there’s power in the message! So here’s where it comes full circle…. I have been known to be somewhat of a “rules” Mom, harping on my kids with suggestions about practically everything. (I honestly prefer the word suggestions over rules, just saying.) My handy little tidbits like, “Wash first,” “Make good choices,” and “No food in the bedrooms–EVER!” are expressions that I have uttered for years. These phrases have become practically automatic after more than a decade of parenting, only now I hear my kids mumble them (and several other goodies) before I can even get the words out. I’ll admit that sometimes they’re mumbled sarcastically, still I don’t mind claiming it as a tiny victory! I’m employing a similar approach with quirky sayings, inspirational quotes and Bible scripture spread across posters, white boards and post-it notes throughout the house. I’ve got my fingers crossed that these, too, will make their way inside their heads (and hearts,) and if nothing else that they might gain some wisdom from my efforts. 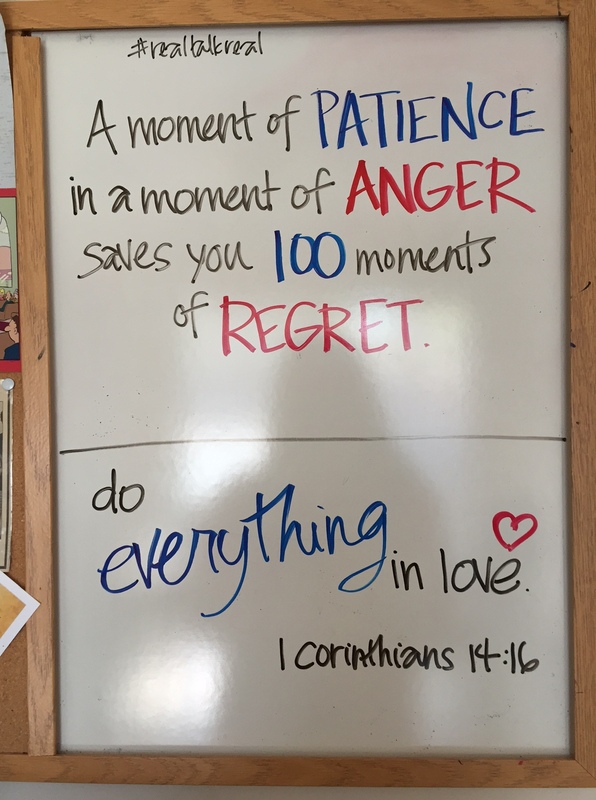 I know I’m doing something right when I see their friends stop and check out the kitchen whiteboard and ask questions about the “Family Rules” poster on the fridge…and I’m just getting started! Window markers allow me to write messages to my children on mirrors in their bedrooms and thanks to iPhone technology, I have several great memes saved and ready to send to my kiddos’ devices at a moment’s notice. In my book, it all counts. Still the master plan is worth nothing without the one message I utilize several times a day, “I love you.” Out the door, when they come home, before they go to bed and at random times in between, “I love you.” It’s the message I hope they remember most.